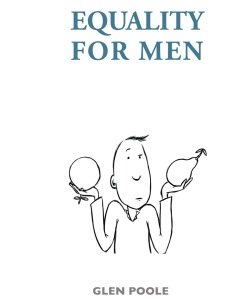 Limited edition of paperback copies of Equality For Men book go on sale…. Some great news, we have just received a small run of paperback copies of our book Equality For Men book by Glen Poole which is now on sale (while stocks last—as they say!). We’ll be officially launching the book on International Men’s Day (Tuesday 19th November) when Glen will be delivering a talk about the book, taking questions and signing copies of the book. If you want to find out more about this event and would like to book a ticket to attend then see our post about the launch event here. We look forward to getting your copy of the Equality For Men book into the post for you! This entry was posted on November 14, 2013 by equality4menuk in Uncategorized and tagged equality for men book.